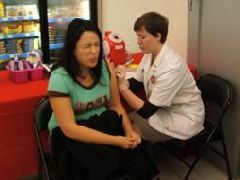 BETHLEHEM, Pa. — Walgreens is joining forces with FamilyWize Community Service Partnership, the Department of Health and Human Services and United Way, to provide a series of community health clinic events at no cost to make flu vaccination more accessible in underserved communities throughout the country. Flu shots vouchers donated by Walgreens and the Department of Health and Human Services provided at Nazareth Hospital in Philadelphia. These organizations are working together to help deliver flu shots for uninsured and underinsured residents, and encourage preventive measures heading into the winter months and the peak of flu season. From 11:00 am to 2:00 pm on Saturday, November 18, in Nazareth Hospital’s Human Resources Library, Walgreens will be administering no cost flu shots for all those who qualify for a flu shot voucher. The vouchers are available on a first come, first served basis, while supplies last and are provided by Walgreens as part of a nationwide program that helps to make flu shots available to those without health insurance coverage or are unable to afford a flu shot. “At FamilyWize, we care about Americans affording what they need to stay healthy. Whether it’s prescription medications or preventative vaccines, our mission is to support the communities we serve and make a happy, healthy life accessible,” the organization said in statement.